Our Spanish language edition is available now! ~ Carter Heyward, Professor of Theology at Episcopal Divinity School (now retired). 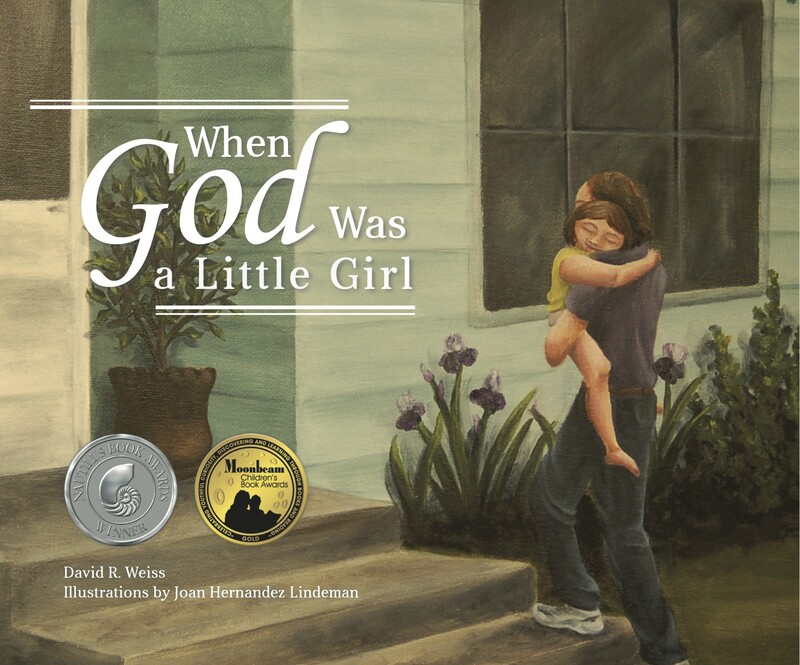 “Tell me a story, Daddy … about when God was a little girl.” Susanna’s playful request begins a whimsically profound tale woven between father and daughter. Together they retell the familiar story of creation, but with unexpected twists and insightful turns along the way. The exuberant joy of God’s creative energy sparkles in this tale that honors both interconnection and diversity. Between the gentle wisdom in the text and the beautiful paintings that accompany it, you may never think about God, creation, or yourself in quite the same way. The book is available — right here! It will only stay on store shelves if it sells OFF store shelves. Please support the stores that carry the book. When you buy a copy in person, let them know you’re glad it’s there! Also, any bookstore in the U.S. can carry it. 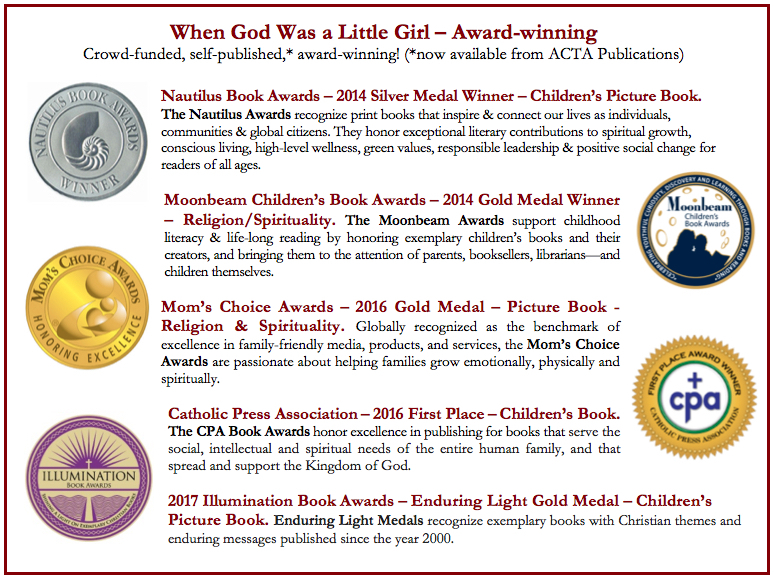 It’s available to them direct from our publisher, ACTA Publications, or through Ingram, a national book wholesaler. Ordering it through your local bookstore — especially if you talk it up before and after the order — encourages them to carry it for others to see, too. Our latest post is right here. I received my copy on Sunday and absolutely LOVE it! Just ordered more copies as I can’t wait to share this with my friends. Just got this book… it’s amazing, and profound, and simple, and beautiful! Highly recommend!!!! I read this to the children in church this morning. I got lots of positive comments. I bought this book after seeing the review on the Storypath blog. As a minister at a liberal Baptist church, I am so grateful for books that present a theology that I can share with the children (and adults) without worrying about the negative ideas they may be learning. Thank you so much for a book that expresses so many wonderful images of God and God’s creation. I especially like the embracing of darkness as embodiment of Love and the many different ways you show the creative spirit — music, gardening, art, etc. Thanks, Libby! What a nice endorsement! what a lovely way to introduce children to God’s Love! I hope this will be ok with you, and if it is not, I’ll take it down right away. I had a Dad and his daughter read this together during message time one Sunday at church when I couldn’t be there as the Pastor. It was a great sermon, and I’ve added it to our podcast, but included a link to this site so people can by the book. I’m hoping that by giving you credit, linking to your website, and letting you know, plus offering to remove it, that you’ll be ok with it. Cynthia – that sounds wonderful! We’d love to see a photo!